While cave tours are held daily year-round at Squire Boone Caverns, summer time brings the rest of the park to life and all Squire Boone Shops will be open daily starting Memorial Day weekend! Start planning your family daycation now! CORYDON, Ind. - May 18, 2016 - PRLog -- It's been a cold and wet start to 2016 and Squire Boone Caverns is officially over it. The 2016 Summer Season is kicking off this Memorial Day weekend and we are excited to welcome you on the perfect family escape without the travel! Boasting North America's largest rimstone formations where over 1 million gallons of water pass every day, all of the recent rainfall means even more water flowing into the cave system. The roar of the rushing underground streams and waterfalls provides the perfect soundtrack for the Cavern tour and a unique view of the cave system. Nestled in the hills of southern Indiana, Squire Boone Caverns is more than just a cave attraction, though. As you explore the grounds, you're walking in the footsteps of brothers Squire and Daniel Boone, two of America's most prominent pioneers and explorers. In the settlers' day, Squire Boone built the property around the cave into a bustling and prosperous settlement - one of the first in the territory that would become the state of Indiana. As Indiana celebrates its bicentennial throughout 2016, a visit to Squire Boone Caverns is essential! The SBC Shops offer your family a glimpse into the lives of America's pioneers and provide a fun environment for families to learn and explore. - Historic Boone's Mill - The heartbeat of the settlement, Squire built the gristmill that provided for the original township around 1804. The mill has been carefully restored to working order and greets each visitor to SBC. Powered by the natural water flow from the original entrance of the cave, the staff miller explains how the mill was crucial to survival through a live grinding demonstration. Without Boone's Mill, the settlement Squire built would not have been as prosperous and the sound of rushing water through the mill reminds of us the dedication and vision that led Squire through his adventures. - Soap Shop - learn the painstaking process of making lye soap in the Soap Shop, as well as the benefits and many uses of lye soap from our knowledgeable craftswoman. Soaps made on premise, as well as from a few of our favorite local soap makers are available for purchase. We guarantee it will be nearly impossible resist trying at least try one bar of our soap! - Hannah Boone's Candle Shop - named in honor of Squire's sister, Hannah, at the Candle Shop you will learn the art of candle making (did you know it takes 45 minutes to make just one small tapered candle by hand!). Along with a live demonstration, guests can try their hand at candle dipping and discover that it's not as easy as it looks. 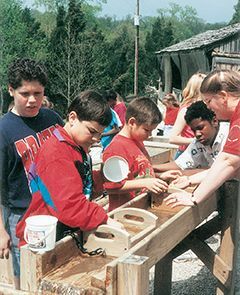 - The Rock Shop: Indiana's largest (and one of the largest in the Midwest)…the Squire Boone Caverns Rock Shop is home to thousands of pounds of mineral, fossil and crystal specimens in small and large sizes, with hundreds of varieties to discover. The Rock Shop also features a large selection of gift and decor items: bookends, water fountains, figurines and jewelry all made from nature's beautiful minerals and gemstones. - Gem-mining Sluice: Just outside the Rock Shop, our 50 foot sluice gives you the opportunity to mine for minerals and gemstones the way prospectors do. Amethyst, citrine, quartz crystal, rose quartz and even gold (of the fool's variety) are among the treasures waiting to be discovered. - Boone's Kitchen & Candy Shop: Providing a taste for any appetite, take a break with our homemade sweets and savory lunch options. We're a little biased, but our special recipe chicken salad (made fresh every day) and fudge using real cream and butter will have you drooling for more. Dine in our air conditioned dining room or find one of the many picnic areas on the grounds. - Nature Trail & Picnic Areas: after spending a few hours exploring the grounds and filling up at Boone's Kitchen, stroll our nature trail while the kids play at the playground. - Traveler's Rest: Squire carved a sign from stone around the cave declaring "Traveler's Rest", indicating his hospitable and welcoming nature. Take a few minutes to relax in our Traveler's Rest: challenge someone to a game of checkers and learn more about the Boone family and Indiana history in an air conditioned cabin. - Gift Shop: Any souvenir or gift you could desire is in our Gift Shop so you can always remember your time at Squire Boone. We're willing to bet you'll come back just for the shopping! Be sure to check for our Gristmill Baking Mixes including muffins, coffeecake, fudge, breads and cookies, all made from natural ground grains by our staff at Squire Boone Caverns. - Squire Boone Caverns Zipline Adventures: an eco-adventure with an adrenaline rush. The state-of-the-art zipline course traverses from tree to tree through the forested hills above the Village. It spans 2,500 feet and includes six tree-mounted platforms and a 50-foot-long swinging suspension bridge. At speeds up to 35 mph over scenic valleys and ravines, the Squire Boone Caverns Zipline is an exhilarating experience you'll never forget. Our smaller explorers who don't meet the height and weight requirements can take advantage of a smaller course with two ziplines and a suspended bridge. The zipline fills up fast - reservations are recommended. The caverns remain a cool 54 degrees year-round, so a light jacket and comfortable walking shoes are recommended.